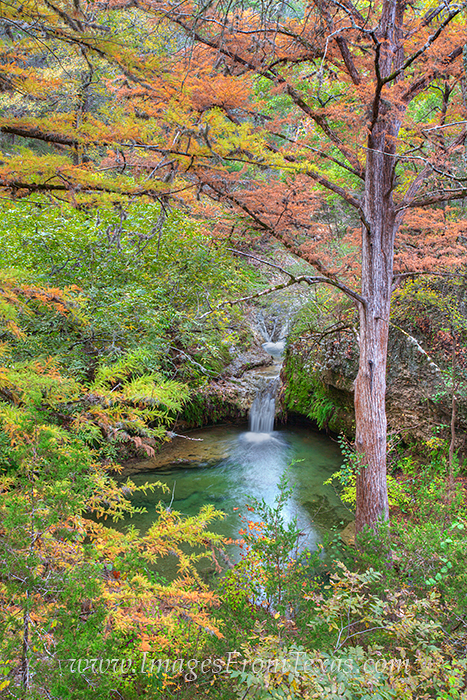 From a lookout over the small but beautiful falls, the cypress really show their colors in the fall. This Texas Fall Colors image comes from November and is one of my favorite places to photograph the Texas Hill Country. The falls were flowing the most I've ever seen in this image thanks to the recent rains in central Texas. If you visit Pedernales Falls State Park, this is a gem, and I've never seen another person at this lookout, so you'll probably have the place to yourself! Photo © copyright by Rob Greebon.